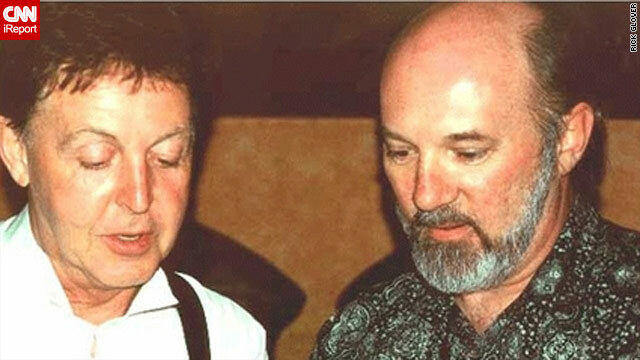 Rick Glover and Sir Paul McCartney at the Iridium Jazz Club in New York, June 2001. Editor's note: For iReporter and rock 'n' roll fan Rick Glover, one summer night in New York in 2001 proved to be extra special. He was at the Iridium jazz club in New York, hoping to meet legendary guitarist and inventor Les Paul, who was performing. He was stunned when former Beatle Sir Paul McCartney also arrived at the venue. Here, on the first anniversary of the death of Paul who played a leading role in developing the modern electric guitar, Glover tells CNN about his encounter with his music icon. (CNN) -- I'd been to the club several times before. I love to come to New York and any time I got a chance, when Les Paul was still alive, I would always try to schedule to see him play. It was a thrilling night. I had brought my Rock and Roll Hall of Fame program for Les Paul to sign; the bonus of having Sir Paul there too was incredible. He seemed very, very cordial. Sir Paul got up on stage with Les Paul and said how much The Beatles loved him. Now he was having a good time, too -- because that was in the early stages of his relationship with the lady we don't even mention any more. At one point, Sir Paul got up on stage with Les Paul and started clowning around with him, saying how much the Beatles loved him and stole his songs but had never been able to give him any credit. So he got a one-dollar bill and handed it to Les, who was just beaming. I approached him after the performance to have my book signed and take a photo. There were only about sixty people in the club, it's a very small room, so Sir Paul gave everyone at the Les Paul performance a very special experience. He looked every person in the eye; you could see the electricity coming from his eyes to theirs and he was just so gracious. I think he really enjoys being one of the normal people, and not being on a pillar. I had met him once before after a concert, very, very briefly, but this was something special. I've been a huge Beatles fan from day one, when I was ten years old and watched the Ed Sullivan Show, the television program that introduced the Beatles to the United States. I'm a musician myself, I play bass guitar with a little band in Atlanta, where I live. We love making music and that was inspired by Sir Paul.